Stock photo displaying rows of authentic Chinese foods, herbs, and spices shelved outside a market in Toronto's Chinatown. 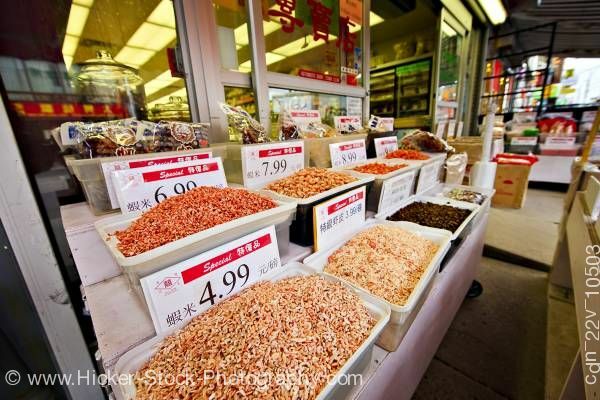 This stock photo consists of rows of fresh produce shelved above trays heaped with freshly ground spices outside a store that sells authentic Chinese foods/herbs/spices in downtown Chinatown, City of Toronto, Ontario, Canada. Streaks of yellow light shine down over the red and yellow fruit and ginger and brown spices, providing a very cheery presentation of this market's showcase of traditional Chinese foods. From the lower to upper right of this frame, a sidewalk trails off parallel to the shelves of food past another storefront and beyond.